Summary Ralink-based "N750" router with Gigabit ports, USB 2.0 storage and printer sharing and PPTP/L2TP VPN server, but unimpressive wireless performance. I recently had the opportunity to take a look at the new EnGenius ESR750H XtraRange Dual-band Wireless-N Router. 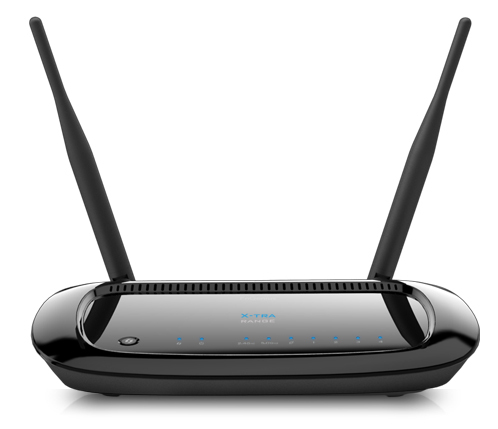 The router promises "extended range and expanded coverage" via its 100 mW maximum transmit power. But as we've seen before, higher transmit power doesn't always produce greater range. Out of the box, the router is rather small and unassuming, about as big as a mid-sized Android tablet in a thick protective case. In the box are a quick install guide, 12V/1.25A wall-wart power adapter, Ethernet cable, user CD, tech support card and two 5 dBi omnidirectional antennas. Figure 1 below shows the callouts of the ESR750H and gives you an idea of its smaller size. The ESR750H includes a USB 2.0 port that supports several interesting features such as shAir and NetUSB Mode, which we'll get into later. The four LAN ports are Gigabit, as is the single WAN port. In keeping with the router's "XtraRange" claim, the external antennas are 5dBi for longer range and coverage vs. the usual 2 dBi. There are also internal antennas, which I'll explain shortly. I took the ESR750H apart, however the major chipsets were all covered by ceramic heatsinks. So to give you a better idea of the hardware, I went to the FCC site and pulled the internal pictures. The key components are summarized in Table 1 and show a design based on the Ralink RT3883F SoC. We've seen this device before in the TRENDnet TEW-692GR and Belkin N750 DB, which I've pulled into the component table for comparison. The RT3883F handles both 5GHz radio functions and serves and the CPU. The 5 GHz radio connects to three internal fixed-position antennas that you can see in Figure 3 below. The 2.4 GHz radio is handled by the Ralink RT5392L and connects to the external antennas. So if you want to swap in higher-gain antennas, they will affect only the 2.4 GHz band. Figure 4 shows a closeup of the board so you can see component detail. The flash chip is on the other side of the board and memory is under the bar code label.